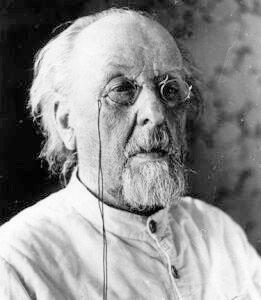 Konstantin Eduardovich Tsiolkovsky (Константин Эдуардович Циолковский, Konstanty Ciołkowski) (September 5, 1857 – September 19, 1935) was a Russian and Soviet rocket scientist and pioneer of cosmonautics, who spent most of his life in a log house on the outskirts of the Russian town of Kaluga. Tsiolkovsky was both a scientist and a visionary. He believed that space could be colonized and that its conquest would enable humanity to realize a potentiality yet unimagined. He directly influenced Soviet space exploration and several stages of his visionary developmental plan for space travel have been achieved. His pupil, Sergey Korolev became the creator of the Soviet space program. He wanted his science to improve the quality of life. On the one hand, he thought that humanity should leave its cradle, the earth; he also realized that humanity also needs to sustain the life of the planet through wise use of technology. His confidence in humanity's ability was so strong that he believed that humans will be able to survive even the death of the sun, and in this way intuiting from scientific commitments and passions, the religious sense of the eternal quality of human existence. His science remains a valuable source of inspiration for those who wish to push out the limits of human capability. He was born in Izhevskoye (now in Spassky District), Ryazan Oblast, Russia, in a middle-class family as the fifth of eighteen children. His father, Edward Ciołkowski, was Polish; his mother, Maria Yumasheva, was Russian and an educated woman. As a 10 year old child, Konstantin caught scarlet fever and became hard of hearing. For this reason he was suspended from the local school for boys, so he was home schooled instead. He had never completed any formal education. His father's library became his school, his disability became his driving force. While living in Moscow in 1873-1876, he continued his self-education and spent most of his time in libraries. Konstantin studied mathematics, analytical mechanics, astronomy, physics, chemistry, as well as classical literature. Unfortunately, his father could send little money to support him. So, he would survive mostly on the "black" bread—rye-bread—the cheapest bread in Russia to save money for books, equipment for experiments, etc. Tsiolkovsky’s arrival in Moscow coincided with profound economic and social changes in Russian society. With the abolition of serfdom in 1861, masses of freed peasants started moving into the city, providing the workforce for a newly industrializing Russia. This spurred the bloom of the arts and sciences. Tchaikovsky and Tolstoy were beginning to dominate the minds. Dmitri Mendeleev developed the first periodic table of elements, and Nikolai Zhukovsky did his pioneering work on aerodynamics. In such an atmosphere, he was fortunate to get a philosopher, Nikolai Fedorovitch Fedorov, as his personal tutor. Leading proponent of Russian Cosmism, he became a "one man university" for Konstantin. Fedorov's lectures and, in part, Jules Verne's novels became a source of inspiration of space flight. Since that time, he began to think about the problems of space vehicle design. The idea was not only to go into outer space, but to conquest space, so humanity can become a space civilization. After returning home in 1876, he passed exams for his Teacher's Certificate, and became a math teacher in Borovsk, Kaluga Province until 1892. During this period, while working on air balloon building, life in free space, aerodynamics, philosophy, and building the centrifuge to investigate the influence of gravity, he married to a local preacher's daughter, Varvara (Barbara) Sokolova, with whom he had 7 children. In 1892, as a result of promotion, he moved to Kaluga were he stayed until his death in 1935. Nearly deaf, he worked as a high school mathematics teacher until retiring in 1920, when he received a government pension. By that time he was well known scientist—a member of the Soviet Academy of Science from 1919. The period in Kaluga became the most fruitful for him as a space scientist, making him a godfather of rocketry and space exploration. However, this time was far from being unclouded. Everyone was afflicted by the turmoils of the revolution. And as many of those brought up before the Revolution, he had a hard time getting adjusted to the new government. Almost immediately after the Revolution, he was arrested by the CheKa (Bolshevists secret police, future NKVD) and thrown in to the prison in Moscow for few weeks, on allegation of anti-Soviet writings. Had some high ranking official not intercede for him, he would have been killed. The "re-discovery" of Tsiolkovsky by the Soviets happened only in 1923. German rocket pioneer Herman Oberth, in 1923, published his own independent discoveries in the work, "The Rocket into Interplanetary Space," along side a review on the works of Tsiolkovsky. In-line with the Soviet practice of "finding" Russian "nugget" of invention for major discoveries like light bulb, radio waves, steam engine etc., he was praised as the brilliant genius from the heart of mother Russia, who struggled for years to find official recognition in the atmosphere of ignorance and indifference of czarist Russia. Many of his works were widely published and some international recognition followed. However, in spite of all the Soviet pomp, his most groundbreaking works were accomplished before 1917. Besides, his philosophical views were ignored, if not silenced. Marxist ideology would never accept the idea that Universe as greater and higher then human being—the inspiration that was a driving force of his space orientation. Moreover, should he live longer, for this very reason he could very well face the same fate as those purged by NKVD in 1937 and later—until his last days he tried to popularize his ideas on the Universe and human role in it. Tsiolkovsky theorized many aspects of space travel and rocket propulsion. He is considered the father of human space flight and the first man to conceive the space elevator, after visiting Paris, in 1895, and becoming inspired by the newly-constructed Eiffel Tower. His most famous work was Исследование мировых пространств реактивными приборами (The Exploration of Cosmic Space by Means of Reaction Devices), published in 1903, which was arguably the first academic treatise on rocketry. Tsiolkovsky calculated that the speed required to orbit the Earth is 8 km/second and that this could be achieved by means of a multi-stage rocket fueled by liquid oxygen and liquid hydrogen. During his lifetime, he published not only works on space travel and related subjects, but science fiction novels as well. Among his works are designs for rockets with steering thrusters, multi-stage boosters, space stations, airlocks for exiting a spaceship into the vacuum of space, and closed cycle biological systems to provide food and oxygen for space colonies. Unfortunately his ideas were for many years little known outside Russia, and the field lagged until German and other scientists independently made the same calculations decades later. His work influenced later rocketeers throughout Europe, and was also studied by the Americans in the 1950s and 1960s as they sought to understand the Soviet Union's early successes in space flight. Tsiolkovsky also delved into theories of heavier-than-air flying machines, independently working through many of the same calculations that the Wright brothers were doing at the same time. However, he never built any practical models, and his interest shifted to more ambitious topics. Friedrich Zander became enthusiastic about Tsiolkovsky's work and active in promoting and developing it. In 1924 he established the first Cosmonautics Society in the Soviet Union, and later researched and built liquid-fueled rockets named OR-1 (1930) and OR-2 (1933). 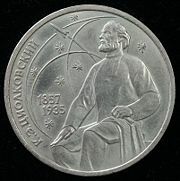 On August 23, 1924, Tsiolkovsky was elected as a first professor of the Military-Air Academy N. E. Zhukovsky. In 1926, he published "Plan of Space Exploration." It consists of 16 Points, from the very beginning of space conquest, until the far future, including interstellar travel: 1) Creation of rocket airplanes with wings. 2) Progressively increasing the speed and altitude of these airplanes. 3) Production of real rockets-without wings. 4) Ability to land on the surface of the sea. 5) Reaching escape velocity (about 8 Km/second), and the first flight into Earth orbit. 6) Lengthening rocket flight times in space. 7) Experimental use of plants to make an artificial atmosphere in spaceships. 8) Using pressurized space suits for activity outside of spaceships. 9) Making orbiting greenhouses for plants. 10) Constructing large orbital habitats around the Earth. 11) Using solar radiation to grow food, to heat space quarters, and for transport throughout the Solar System. 12) Colonization of the asteroid belt. 13) Colonization of the entire Solar System and beyond. 14) Achievement of individual and social perfection. 15) Overcrowding of the Solar System and the colonization of the Milky Way (the Galaxy). 16) The Sun begins to die and the people remaining in the Solar System's population go to other suns. In 1929, Tsiolkovsky proposed the construction of staged rockets in his book Космические поезда (Cosmic Trains). He was also an adherent of philosopher Nikolai Fyodorov, and believed that colonizing space would lead to the perfection of the human race, with immortality and a carefree existence. Tsiolkovsky died on September 19, 1935, in Kaluga, Russia, and was given a state funeral. A museum of astronautics in Kaluga now bears his name, as do Tsiolkovskiy crater on the far side of the moon and asteroid 1590 Tsiolkovskaja. He wrote over 500 scientific papers, and, even though he never created any rockets himself, he influenced many young Russian engineers and designers. Tsiolkovsky lived to see a younger generation of Russian engineers and scientists begin to make his visionary concepts reality. Among these was his pupil Sergey Korolev, who would become the creator of the Soviet space program, that launched into space Sputnik, Laika, and the first astronaut, Yuri Gagarin. Tsiolkovsky’s works are full of ideas that became a common practice in aerospace engineering. "The Earth is the cradle of humanity, but one can not live in a cradle forever!" "Men are weak now, and yet they transform the Earth’s surface. In millions of years their might will increase to the extent that they will change the surface of the Earth, its oceans, the atmosphere and themselves. They will control the climate and the solar system just as they control the Earth. They will travel beyond the limits of our planetary system; they will reach other Suns and use their fresh energy instead of the energy of their dying luminary." A fictional ship, the Tsiolkovsky, was named after him for the television series Star Trek: The Next Generation. The episode it appeared in was entitled "The Naked Now." A copy of the dedication plaque of that vessel, with a rough rendering of Tsiolkovsky's Cyrillic name, was seen in the ship's set dressing (the artist mistakenly used "З" instead of "Э" for the middle initial, and "п" instead of "л" in the last name). Virtual Matchbox Labels Museum - Russian labels - Space - Page 2 - Konstantin Tsiolkovsky Historic images. The Foundations of the Space Age. This page was last modified on 23 April 2018, at 15:44.